We encourage parents to enrol their new entrant at four and a half years of age. This gives us time to make contact with their ECE (Early Childhood Education Centre) so that we can make the transition as smooth & successful as possible. When you come in to enrol the Principal will talk about the school, answer any questions, give you a copy of the enrolment documents and give both child and parents a guided tour of the school. 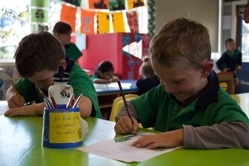 Once you have decided to enrol your child here at Heddon Bush school our junior teacher will contact you to arrange some school visits for your child. Our priority is to make the child familiar with their new environment so they can settle more easily into school. Children will participate in a variety of activities during these visits, have an opportunity to play their friends and get used classroom routines. We want all children to feel welcomed and secure in their new learning environment and we see these schools visits as opportunity for us to get to know your child. We look forward to a successful home and school partnership. Recognise some of the alphabet letter or sounds. Be able to sit and listen to a story. Hold & use a pencil & scissors. Blow their nose and recognise the need to do so. Starting school is a big step and school life is busy and full of routines. Expect your child to be very tired at the end of the day, lots of sleep and encouragement will help them cope with these changes. Remember that the class teacher is always happy to talk and discuss any concerns or questions you may have no matter how small. It is very important to us that children are happy and content so that successful learning to take place.